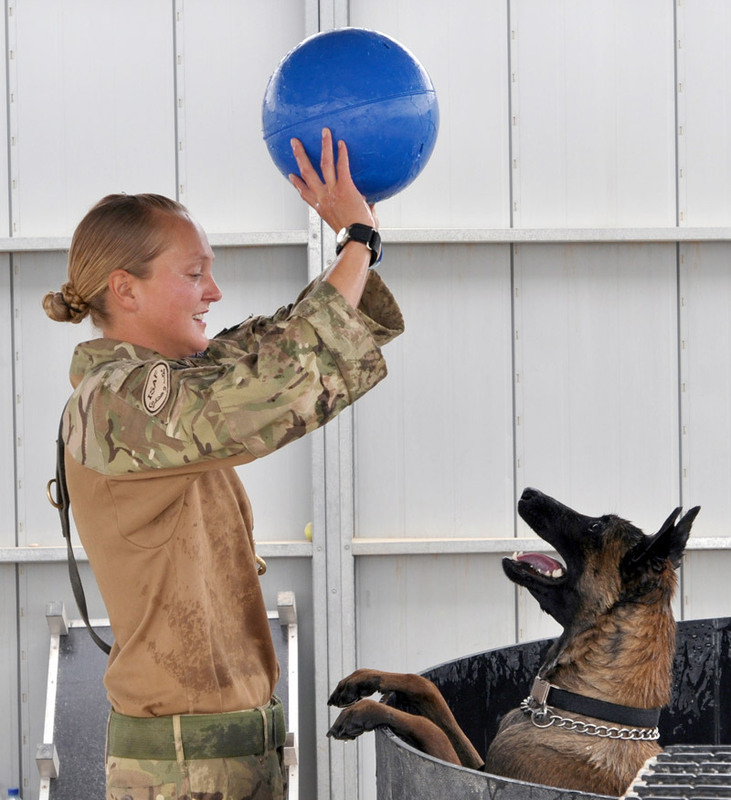 In her second blog, Lance Corporal Kelly Wolstencroft writes about moving out to her Forward Operating Base, and the latest antics of her working dog, Kevin. It’s now been a good couple of weeks since we last blogged and a fair bit has happened, so let me bring you up to speed. Firstly on 5 April, Kevin and I went for our licence. This involves a few test scenarios given by a RESA (Royal Engineer Search Advisor) and my own Sergeant Major, which we have to pass as a team before we are allowed “out on the ground”. At this point Kevin had been working like a dream for a good few days now so I was sure that he was due a “Kevin” day at any time! However we passed the morning search with flying colours and broke for lunch at midday before our afternoon scenario. At 1300 Kevin and I were first up for the final scenario. As I walked towards the RESA, Sergeant Major and my own Sergeant I noticed that Kevin was acting like Kevin and pulling towards them in an eager fashion. As I reached them the RESA came over to brief me on the following search, while being briefed I realised Kevin was no longer pulling, instead he was indicating on the RESA’s bag telling me that he had a bomb in it! I tried to ignore him and set up for the task in hand (in the opposite direction to the RESA’s bag) but despite my best efforts I couldn’t unfocus Kevin from the bag to which end I asked the RESA if I could let Kevin have a good sniff of his bag to satisfy his curiosity otherwise he would be unfocused on the task. The RESA had no problems with this at all so I turned Kevin around and allowed him to investigate the bag. I should have known better! Kevin sunk his teeth into the his bag and started to shake it from side to side as if it was his chew toy until I managed to wrestle it from him! Luckily the RESA saw the funny side of it, as do most when it comes to Kevin. Luckily he went on to do a flawless search resulting in us passing our licensing and we are now ready to crack on with our tour! On 12 April Kevin and I went to Camp Bastion to get a helicopter out to our new location for the next couple of months. 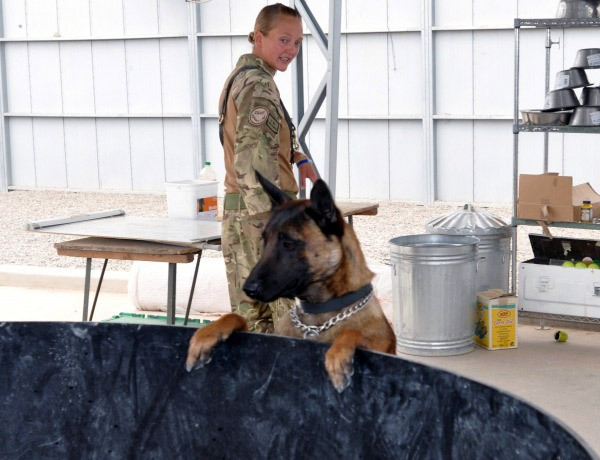 Private Pryce was also on the same helicopter with his MWD (military working dog) – Titch – as he was going to be based just 1km from me in another FOB. Kevin doesn’t mind helicopters – in fact I’d say he quite likes them, it’s the waiting around he doesn’t like and this brings out his mischievous side. As the helicopter landed myself and Kevin along with about 12 other soldiers got our kit together to get on, however just at this point in time Kevin decided he wanted to play tug of war with my bergen whilst I tried to get it on my back. This wasn’t the easiest of games since I was wearing body amour weighing in at about 15kg, my rifle and the bergen alone weighing about 40kg! Unable to fight him off due to all the weight and bulk I walked (struggled) onto the helicopter with Kevin trying to pull us both back off! A short while later we landed in our FOB and as we got off, Corporal King and his MWD – Casper – got on to return to Bastion. We were met by Private Gell and his MWD – Scooby – who then showed me and Kevin our bed space and gave us a quick tour of the FOB. The FOB is a good little set up, but doing training with Kevin is quite hard due to the lack of space, but I’ve managed to set up a few good areas. There is no hot water which means showering is quite emotional, so I try and do it in the heat of the day so it is a little more bearable. Kevin isn’t too impressed with the cold hose I keep using on him either! The toilets are non-existent, as it’s all done in bags which wouldn’t be too bad if I was male, as they also have man-made urinals, but trying to open the bags and set them up while bursting for a wee can be again quite emotional to say the least! However I suppose I can cope with the cold showers and going to the toilet in a bag cause at least I can do it all in a tailored floppy hat with no sun cream on. We have not been on task yet so I’ve been stagging on the sangars for a fair few hours already. In fact I’m writing this at 0420 on 15 April. I’m guard commander of the FOB and Kevin is keeping himself amused with a piece of plastic he has just dragged out of the bin as I’ve made him come on stag with me too. If I have to get up then so can he! When I’m on sangar duty it passes the time but it can be quite boring. Earlier today when I was looking out into the green zone at all the poppies I heard kids shouting up to the sangar asking for “chocolate, chocolate” and “water, water”. Unfortunately I had nothing with me to give to them and was unable to leave my post, eventually they became annoyed and started throwing rocks and stones at me then left, but not before giving me the middle finger! It was like meeting the 7-year old Afghan child version of Kevin, which made me laugh. The FOB I am in was Liam [Lance Corporal Liam Tasker] and Theo’s, so there are a number of things here which mark their presence such as the memorial board the Irish Guards have made which has the names of all those KIA (killed in action) who lived in the FOB from HERRICK 13 and Liam’s name is carved into many benches. It’s been sad but very comforting hearing how liked Liam and Theo were by all the guys… “Liam, what a guy!”, “Theo the super dog!” … and the stories of the two of them together, and what they brought to each patrol they went on. To that end I’m looking forward and consider it an absolute honour to carry on with the good work Liam and Theo started here and continue building the excellent reputation they left behind! During the next week sometime Kevin and I will be out on our first operational task together, so I’m excited to see how that goes and hopefully resulting in Kevin having the first find of Operation HERRICK 14!! So I’ll tell you all about it in our next blog, but for now I’m going to climb into my sleeping bag (with Kevin of course) and get a few hours rest. Night! In her first blog, Lance Corporal Kelly Wolstencroft writes about the start of her tour as a dog handler in Afghanistan. At Midnight on Saturday 5 March, Kevin and I deployed together to start the gruelling journey to Afghanistan on a C17. We arrived in Camp Bastion on Sunday night at 2015hrs. We were met by 104 Squadron (whom we were to take over from), who took Kevin and the rest of the dogs to the kennels while we sorted ourselves out into bed spaces etc. After doing the normal arrivals paperwork I got my hands on a satphone and managed to give my girlfriend and Mum a quick call to let them know all was well. The next morning I woke up and we went straight to the kennels to exercise the dogs. It was strange walking through Bastion again, and seeing how much this place has grown since the last time I was here in 2008/9. We only had Bastion 1 back then – Bastion 2 was still under construction and mainly occupied by other nations. Now Bastion 2 is fully formed and Bastion 3 is established and growing by the day! This also gave me doubts to whether we will actually be out of here by 2014. As I walked around I saw things that were still in the same places they were on HERRICK 9 – like the prison next to the old kennels and the cookhouses (tents). It was quite strange because once I finished my tour back then, I kind of put this place to the back of my mind. All the time it’s still been here, being used in the same way while I was back home in barracks, on leave or on holiday… It’s plain to see that even though I had left, the job here was/is far from over! So here I am again to start the 6 months and 21 days tour all over again! Over the next few days we attended training where we were updated on all the recent threats “outside the wire” [outside Camp Bastion]. I was dreading the training as it was “death by Powerpoint” on my last tour, but if I’m honest even though I was tired for the first week, the training was excellent and I found myself very interested in most of the briefs! However I was still itching to get it behind me so I could concentrate on starting work with Kevin and seeing how he would cope with the desert conditions and heat. On 10 March we got up at 0300hrs and paraded to say our goodbyes to Liam [Lance Corporal Liam Tasker] and pay our respects as his coffin was carried past us, up the ramp and onto the plane. The last post was played and this was when most people broke down, myself included. Then the tail closed and we fell out. When I looked over my shoulder as I walked off the flight line and the engines were powering up, it really hit me that Liam was gone. Saying bye to Liam and cracking on with work the very same day was one of the hardest things I have ever done, but we had no choice. If the dogs were going to be ready in time for 104 Squadron to leave and finish their gruelling tour, we HAD to get on with it! I’m writing this on 30 March. It’s a few weeks on from when we first arrived here now and things are starting to come together. The dogs are slowly but surely getting used to the change of climate and the guys have adapted well to working in the heat, although trying to train dogs in this heat can be quite testing, especially if your dog’s name is Kevin! However the training facilities for the dogs here in Bastion are excellent. With a little imagination and knowing the right people you can have a training session with your dog which actually mimics to a tee the kind of searches you will be tasked to conduct outside the wire. This is filling the guys with confidence in their dogs. Basically, if your dog can do it in here, then they can sure as hell do it out there! 104 Squadron have now returned back to the UK for some much needed leave and 103 Squadron have taken over operational duties here in Afghanistan. Most of the guys are licensed with their dogs now and out on the ground (outside the wire) doing what they do best and living by big boy rules (sat in a forward operating or patrol base, wearing tailored hats, shorts, flip flops, topping up their tans with no sun cream on and growing as much facial hair as physically possible) while waiting for their next tasking. Kevin and I and a few other teams on the other hand are still in Camp Bastion doing some extra dog training and living by what is known as camp rat rukes – wearing factor 50 and untailored floppy hats. (Well, I’m wearing factor 50 as my untailored floppy hat gives enough shade for Kevin to utilise too!) Big boy rules are within arm’s reach though as the dogs are looking good and if Kevin pulls his socks up and stops locking himself in ISO containers and just being Kevin in general, then we should be licensed in no time. Hopefully the next time I write my blog Kevin and I should be licensed, tanning ourselves and getting massive in a FOB or PB somewhere in Helmand. Wish us luck!